Disneyland and Walt Disney World are constantly updating and adding new attractions to keep up with new movies and expanding franchises. Both resorts have recently had new attractions open this year and are slated for brand new lands in the next two years. Here’s a look at the new attractions you can find as well as some of the additions currently in the works. 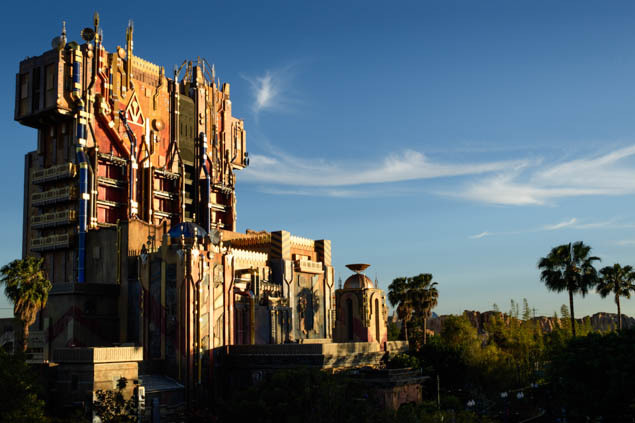 The previous Twilight Zone Tower of Terror attraction at Disneyland was just re-themed to Marvel’s Guardians of the Galaxy film series and opened to fans in May. It’s the same ride system and infrastructure as the Twilight Zone Tower of Terror, but now features characters and scenes related to Guardians of the Galaxy instead. Look for merchandise and themed foods in Disney California Adventure to complement the park’s newest ride. Kilimanjaro Safaris – this existing attraction will now offer a new nighttime adventure where you can watch the setting sun and see two new species to the attraction: African wild dogs and hyenas. Disney’s Animal Kingdom also recently held the grand opening for Pandora – The World of AVATAR. Here guests journey into the world of Pandora, with floating mountains, a bioluminescent forest, and the winged creatures known as Banshees. The biggest attraction in the new AVATAR land is AVATAR Flight of Passage, an E-ticket attraction that takes guests on an exciting flight on a Banshee over an alien world. The entire identity of Disney’s Hollywood Studios at Walt Disney World has been in transition for several years now, and one of the biggest changes will be the highly anticipated Toy Story Land. The 11-acre land will transport guests to Andy’s backyard where they’ll feel like they are the same size as Woody and Buzz. Some of the new attractions for this land will be Slinky Dog roller coaster, Alien Saucers, and Toy Story Mania! Toys like building blocks, game board pieces, plastic buckets, and shovels keep the theme consistent throughout the land. If you’ve visited either Disneyland Paris or Hong Kong Disneyland, you have probably already experienced Toy Story Land, but this will be the first one for the U.S. parks. One of the most anticipated additions to the U.S. parks revolves around all things Star Wars. Star Wars themed lands are coming to both Disneyland and Walt Disney World in 2019. This is scheduled to be the biggest single-themed land expansion, with both sitting at 14-acres each. There has also been discussion about a “remote village” that will form part of the new land as well, but not a lot of other details have been released just yet. The construction of Star Wars Land at Disneyland has changed the course of the Rivers of America, which is set to reopen later in 2017, while the new Star Wars Land at Walt Disney World will be located in Disney’s Hollywood Studios. Some will say that once you are pregnant, traveling is out of the question. That can't be further from the truth! With a little preparation, traveling while pregnant can actually be one of the best trips of your life.